“I take my hat off to the city of Lachute, to have come forward and taken a principled stance,” Slimovitch said. There will be no mention of the first woman to fly a helicopter, Hanna Reitsch, at a celebration of women in aviation in Quebec this weekend, after the mayor of Lachute announced Thursday his town wouldn’t allow the event to proceed if it glorified someone with a Nazi past. 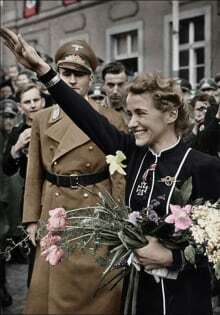 Reitsch, who died in 1979, is remembered not only as a pioneering female pilot, but as a star of Nazi party propaganda. In an interview on CBC’s Daybreak, Lachute Mayor Carl Péloquin said when the town heard about the event, they contacted the promoter and made it very clear they wanted no part in it. It’s not clear if Reitsch will be honoured at other events in Canada and elsewhere in the world organized by the Institute for Women of Aviation Worldwide. Hanna Reitsch (1912-1979) was interested in aviation from early age. She began her training as a glider pilot, established multiple records as such, and was influential in helping improve aircraft designs. Later, she learn to fly powered aircraft. In 1937, Reitsch earned a test pilot position at the Rechlin-Lärz Airfield. Later that year, she became the world’s first woman to fly a helicopter, a Focke-Achgelis Fa 61. After the war, Reitsch returned to glider flying and helped establish gliding schools in India and Ghana. 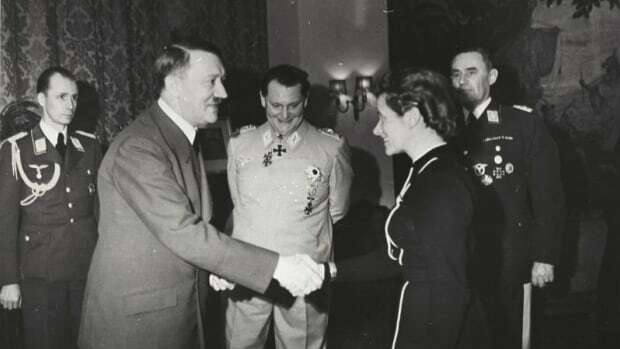 Although her father wanted her to become a doctor, Hanna Reitsch (1912 – 1979) was interested in aviation and thought she might become a flying doctor in North Africa and even studied medicine for a time. Reitsch began flying in 1932 in gliders. She left medical school in 1933 to become a full-time glider pilot and instructor at Hornberg in Baden-Württemberg. She was soon breaking records and earning a Silver C Badge in 1934. She flew from Salzburg across the Alps in 1938 in a Sperber Junior. In 1937, Hanna was posted to the Luftwaffe testing centre at Rechlin-Lärz Airfield. She was a test pilot on the Junkers Ju 87 Stuka and Dornier Do 17 projects. Reitsch was the first female helicopter pilot and one of the few pilots to fly the Focke-Achgelis Fa 61, the first fully controllable helicopter. Her flying skill, desire for publicity and photogenic qualities made her a star of Nazi party propaganda. In 1938 she made nightly flights of the Fa 61 helicopter inside the “Deutschlandhalle” at the Berlin Motor Show. With the outbreak of war in 1939, Hanna was asked to fly many of Germany’s latest designs. Among these were the rocket-propelled Messerschmitt Me 163 Komet and several larger bombers on which she tested various mechanisms for cutting barrage balloon cables. During the winter 1943-44, she was assigned to the development of suicide aircraft. This project where the pilots flew manned bombs and ultimately died during the mission was similar to the Japanese later use of Tokkōtai (“Kamikaze”) and was put forward by Adolf Hitler on 28 February 1944. It is probable that the idea originated with Hanna during her testing of the Messerschmitt Me 163 in 1942, and she was also the first to volunteer for the newly formed Leonidas unit. This program was met with a considerable resistance and was disbanded one year later. During the last days of the war, Hanna was captured along with her companion, von Greim. She was held and interrogated for eighteen months. Her companion committed suicide. Her father killed her mother, her sister, and her sister’s children, before killing himself after expulsion by the Polish from their hometown of Hirschberg. After her release, Reitsch settled in Frankfurt. Following the war, German citizens were forbidden from flying but within a few years gliding was allowed, which she took up. In 1952, Reitsch won third place in the World Gliding Championships in Spain (and was the only woman to compete). She became German champion in 1955. In 1959, she was invited to India by Prime Minister Jawaharlal Nehru to begin a gliding centre. In 1961, Reitsch was invited to the White House by US President John F. Kennedy. From 1962 to 1966, she lived in Ghana where she founded the first black African national gliding school. She gained the Diamond Badge in 1970. Throughout the 1970s, Reitsch broke gliding records in many categories, including the “Women’s Out and Return World Record” twice, once in 1976 (715 km) and again in 1979 (802 km) flying along the Appalachian Ridges in the United States. During this time, she also finished first in the women’s section of the first world helicopter championships.